Making jam is so much simpler than many think. Frankie and I took a class out in Brooklyn back in September of 2015 while living in NYC. It was held at an actually AFFORDABLE adult education center called the “Brooklyn Brainery.” They describe it as a place that provides “accessible, community-driven, crowdsourced education”. I describe it as thinking outside the box and opening up possibilities of new interests for the average person. I’d wanted to learn how to “jam” for years, so when the “Homemade Jam Class” became available and we saw who’d be teaching it, we knew it couldn’t be missed! Laena McCarthy founded ANARCHY IN A JAR in 2009 and taught this small class of 10 or so, my hubby being the only male. (He never minds that situation!) She makes some of the most incredible jams I’ve tasted and I became an instant fan. They’re much less sweet than the average tooth-aching goop you find on the shelves in American grocery stores. McCarthy’s are much more like those we savored in France when we rented a room in a farmhouse from an older couple in the Loire Valley, and the wife jammed all of her own fruits, even tomatoes. The focus is on the fruit, not the sweetness. The sugar is a preservative, not a flavor. So, I feel very lucky to have learned how to “jam” from someone who gets that, preaches it, and creates it. When I buy a bunch of bananas and set them on the counter, they often ripen at a pace with which two people can’t keep up. Sometimes one just doesn’t feel like eating a banana, no matter how many are slowing “tanning”, sweetening, and eventually fading into banana bread territory. My usual answer to not wasting mushy, sweet, but blackened bananas is to freeze them for smoothies through out the next week. But sometimes I get a hankering to be a little more creative. 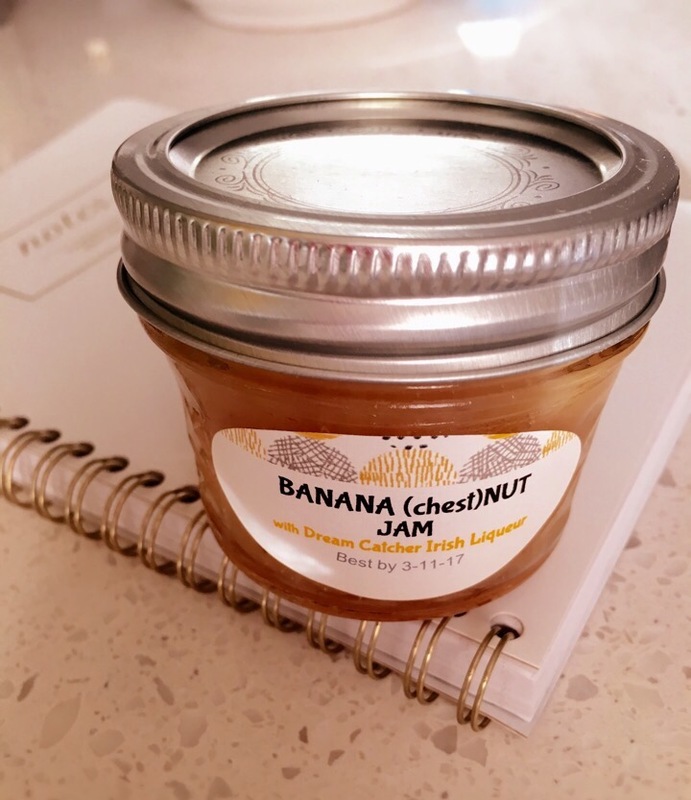 Plus the hubby doesn’t “do” smoothies, but he loves the banana flavor in just about anything. So my solution was to preserve these 5 “past their prime” bananas in a way he would get to enjoy them as well. 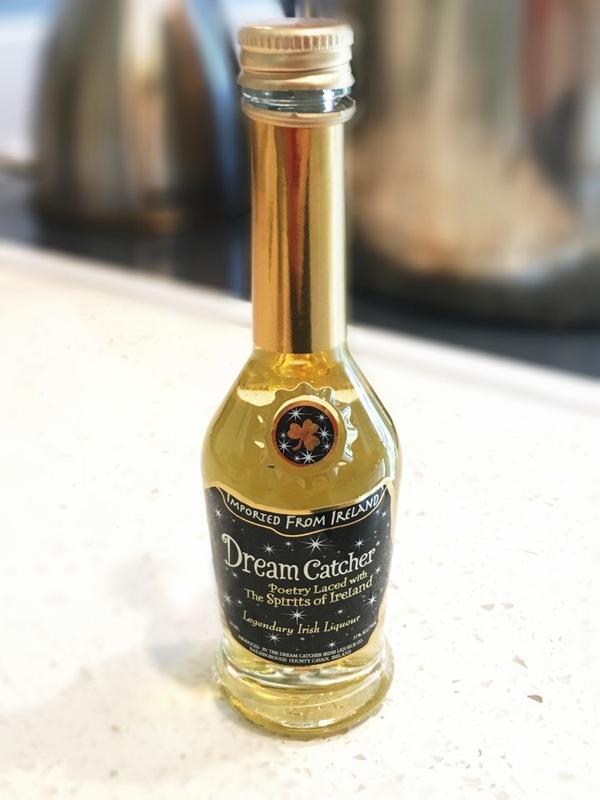 With St. Patty’s day around the corner, I felt it fitting to flavor this jam with a wonderfully nutty, Irish Chestnut Liqueur called Dream Catcher. Its quite sweet and has a bit more alcohol bite than other liqueurs with which I’ve baked. But cooking off the alcohol leaves a wonderfully subtle, toasted nut flavor that is ever so slight. If you aren’t a “Jammer”, you can keep this in an airtight container and keep it in the refrigerator. If you do “can”, you know the deal! Peel the bananas and trim a 1/2″ off each end. Mash them and measure out the 2 1/4 cups. Combine bananas, lemon juice and sugar in a NON-reactive pot or Dutch oven. Bring to a boil over medium heat, being very careful it doesn’t scald. Cook for about 5 mins. Add in the Dream Catcher and allow to cook for about 1 minute. Check for gel by dropping a tiny bit onto one of your frozen spoons and letting it sit for about a half a minute. Gently move the jam around with your finger a see if its thickened enough to spread. If there is liquid surrounding the fruit, then cook your jam another minute or so, and test again. BE CAREFUL NOT TO BURN YOUR JAM! Remove from heat and either spoon into your sterilized jars and process, or spoon into your airtight container. Allow to cool then move to the fridge. Impress your family and ENJOY! Therapeutic Pets? He Was My Furry Companion.